Idealists usually don't get too much satisfaction out of ultras. The sheer length of time, the variety of terrain, the amount of food that must be eaten, and the myriad amount of ways to attack a course leave an infinite amount of possible "mistakes" to be made. I don't believe even the best races in the sport -CR's such as Scott's 15:36 at Western, or Anton's 16:14 at Leadville, or Kyle's 23:23 at Hardrock have mistakes that the runner's themselves admit added maybe 10-100 minutes. This just is the nature of a sport that is too wonderous to be a simple science, but rather an artform on dirt (and sometimes pavement). That said, I went into AR not quite 100%.. or 90% for that matter. I foolishly agreed to a shoot for a Gatorade commercial one day before the race. I thought there'd be tons of other people to run hard, but it turned out I was the only one that day, and the director wanted plenty of takes.. So I ran a good 30-40 strides anywhere from 600 yards to 200 yards.. and some with a "doggy cam" (aka "the b---h cam") that was just an absolutely ridiculous contraption that mounted an SLR locked in place in front of my head. I enjoyed the day and felt confident at the time knowingly fully well what I was doing, but was much more sore the following day than I expected to be. Standing around and then taking off at a dead sprint had done a number on my calves and the backs of my knees. I finished the day with a 1-2 mile "take" running 6:00 pace and below along a paved road with the van following on the side. When we finished I really should have cooled down more, but instead I hopped in the van and drove down to my car. Driving up Friday with my parents and Katie, I felt the full effects of the mistake at every rest stop when I'd try to shake out the legs. It felt like I had no power and was extremely tight in the back of my knees. Sitting in the hot tub at the hotel the night before helped, but I felt very nervous on race morning. The race started right on time and I tried to ease into a grove settling into an easy 6:30 pace just ahead of GR and the chase pack following an overly ambitious speedster. I began to yo-yo between that pack and was needlessly overworking a bit as I tried to stay within striking distance of MK and GR. I had good food/salt/fluid intake, but the body just wasn't relaxed, and it was a tough chore everytime. Eventually we began a short climb to Nimbus Overlook, and the weakness in my calves that I was afraid of was exposed as the power I was looking for was muted, and I fell off the chase pack into no-man's land. 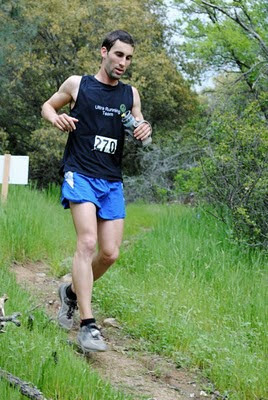 I started to recognize the Rio del Lago course that had been my first 100 miler nearly 2 years ago. I remembered the nice sections and the not so smooth sections and felt the weakness in my legs exposed even more as I tried to maintain my balance coming off the two dirt hills. I came through the marathon at 2:54 and began to search for my crew to switch to my MT100's. They were nowhere to be found (lost due to some 'tricky' directions from the course website), and I turned back for a few moments to reload Gu and water at the aid station as I wasn't sure when I might get more food. Eventually they caught me as I was exiting the Beal's Point park and I laced up my MT's to get things going on the trail. 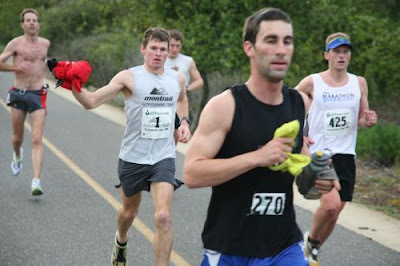 By far the worst section of the race, I began to contemplate bowing out. The manageable 6-7 minute gap between me and the leaders began to grow exponentionally as I struggled to find my stride for 5 miles that seemed to go on forever. A hill that required no walking, forced me to a very slow power walk and muted my energy levels. I felt as if I had just been hit by a truck, and I had 1/3rd of a body left to try to salvage a finish out of. It seemed worthless and impossible to make the final 23 miles in less than 4 hours, and I began to wonder if I was even running under 10 minute pace. When I finally got to the 50k mark, it had taken me 45 minutes to cover 4 miles, and I had completely lost the race for the WS spot. To put it simply, I had nothing to absorb the transition, and as Erik Skadden would later agree, our legs felt like glass, and the trails were demanding more give than our ankles and knees were willing to give. I actually watched Erik fly down a single track and run into a frozen Boy Scout troop leader due to the shakiness in his legs. Though it's such a simple idea, the ability to absorb changes from road to trail is a very clear indicator of how strong, healthy, and flexible a runner is. That day, the course separated the two groups of people very clearly. Finding my groove, the legs began to come back as the MT's gave my feet some confidence on the scattered rocky sections. 2:53 for the last 19 wasn't brilliant (9:05's), but it was much better than the alternative of staying above 11's. 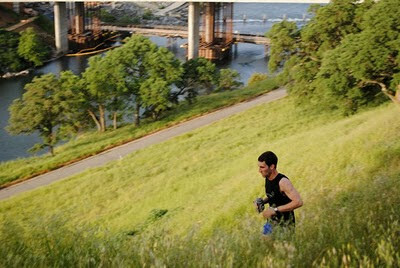 I had to grapple with the course quite a bit to really get some momentum going further up the river, but I eventually felt strong enough to power up the last hill with enough power to fight off a late attack from another young runner. It felt great to push myself up the last hill and know I hadn't lost everything, but still bittersweet to think of what I could have done if I was better prepared and understood the nature of the course better. 50 miles, 6:33, 10th overall, (7:52/mi). Onward to dance with TK, HK, and pack of wildcards at Miwok in 3 weeks. Did you honestly think that you were running for a WS spot? Too bad things didn't work out as you hoped Dom. Nice job on powering through and finishing top 10!! You're running Miwok next right? Did you hear that Anton is gonna be there? Think you can beat him? Yeah, it takes some dreaming to swing for the fences. I wasn't a favorite like MK or GR, but I had enough of a chance to run for it and give it my best shot. Andrew Henshaw wasn't even running for a WS spot, but he ended up with one. I don't think racing ultras is so much about beating certain people, as it is like a poker game and just having the right cards on race day. You can train exceptionally well and be invincible on the paper of a training log, but if you get lost or have food poisoning or run foolhardy, you're not gonna be the best runner that day. I think TK is a favorite for good reason, but I'm going to try to run my best regardless. I have a job opportunity in LA but I'm not sure about giving up my trails. Can you fill me in on a decent place to live where I can run trails? I'm looking for easy access either running, short bike ride, or even short drive. Any help is greatly apprecited. I also see you'll be at Miwok. Maybe I can ask you some more questions of the the run.